Today Charlie, Erin, Becky, Nicole, and Caroline went to ELWA Hospital. Nicole demonstrated her newborn physical assessment skills. The rest of the team did burn and wound care and assisted with a patient in crisis. In the morning, Anne-Marie, Kathi, and Kathy Beth met with Emma Katakpah, Clinical Assistant to the Fistula Project, Sametta D.G. George, Fistula Coordinator, and Sualaho M. Koon, UNFPA Accountant to the Liberia Fistula Project. 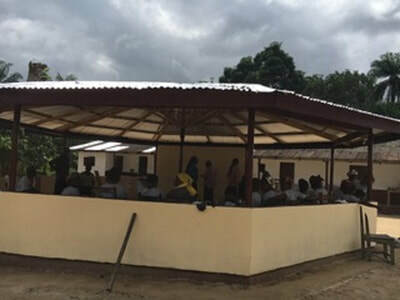 In the afternoon, they met with Juliette and Dr. John Mulbah who own and manage the Family Clinic in Jacobtown, Monrovia and discussed Dignity:Liberia's future Maternity Waiting Home. 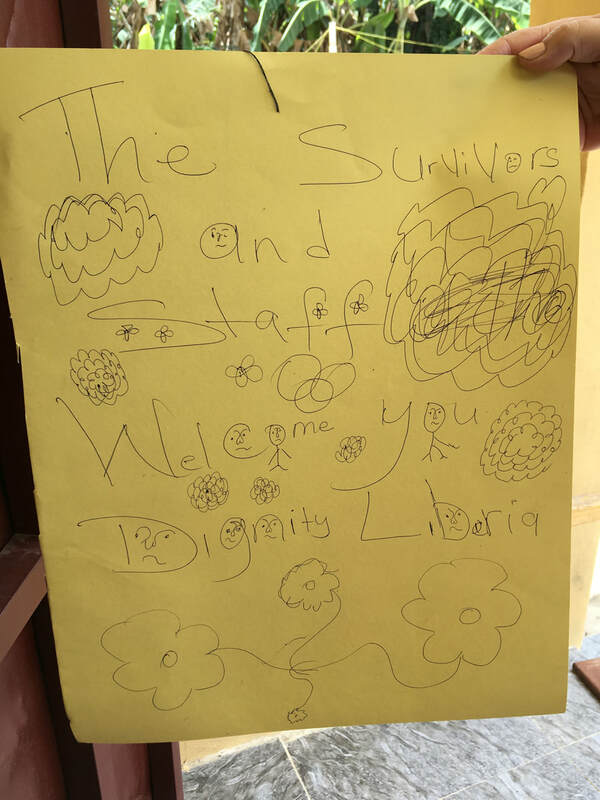 Later they visited the Dignity:Liberia in Liberia office housed on Dr. Mulbah's compound and met with Office Manager Matthew Walters. We have posted many trip updates directly on our Facebook page. Please be sure to visit it daily. For more on about the team members, see last month's blog. Thank you for your interest and support! 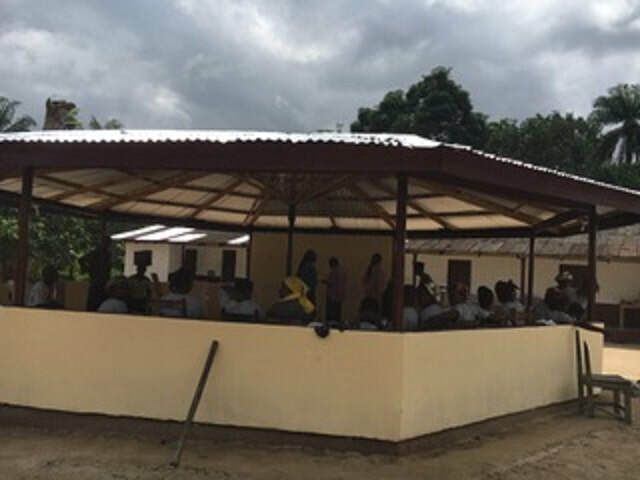 The palava hut at the Fistula Rehab Center is completed. It looks wonderful! We are looking forward to sitting in its shade and visiting with our friends. Kerri and I had a wonderful time at the Medical Missions 101 Gathering. 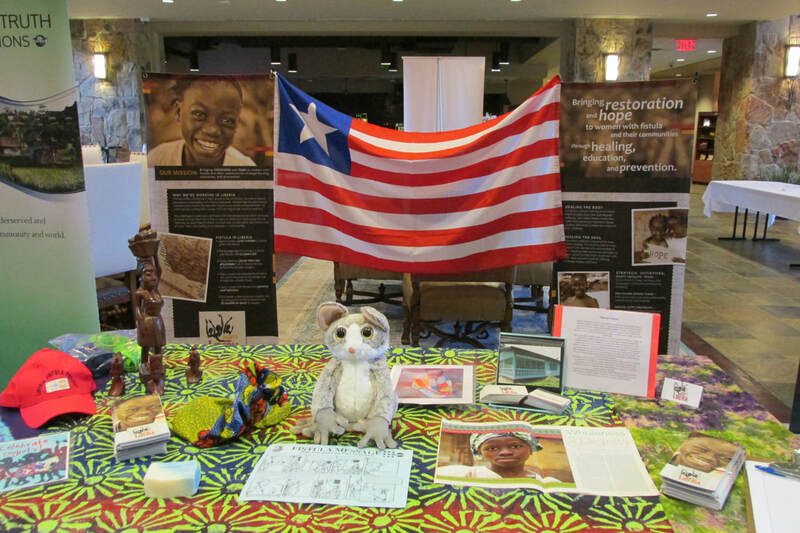 We met many wonderful people who have served on medical missions to different countries and learned about how their organizations provide direct help or provide assistance to organizations such as Dignity:Liberia. We attended presentations on various topics which included discussions on making sure well-intended efforts don't cause harm. We were pleased to note that Dignity:Liberia already follows much of the advice we heard. We picked up a couple of copies of a Health Education handbook that stresses health promotion and prevention. We shared with others what we have accomplished over the last six years, and the news that our maternity waiting home is getting closer to becoming a reality. It was a very worthwhile way to spend the day. 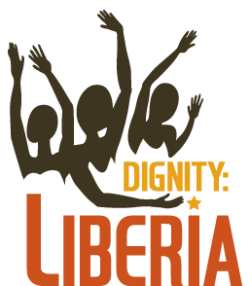 Dignity:Liberia is attending the Medical Missions 101 Gathering in Plano, Texas on May 19th. 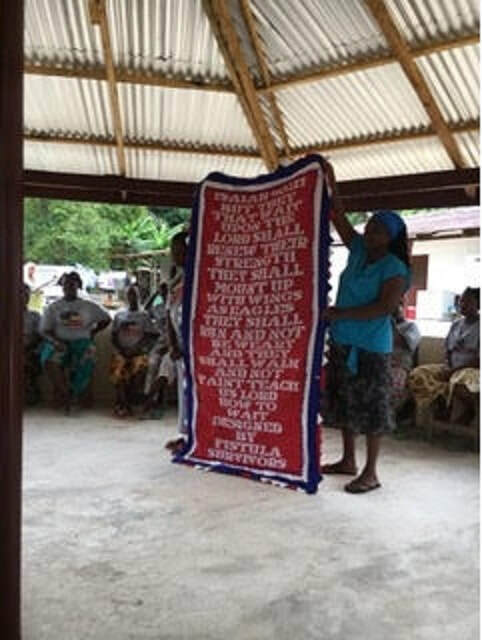 We hope to make new friends and spread the word about our efforts to end obstetric fistula in Liberia. Our friend Richmond Bracewell had these bags made for Kathi and Anne-Marie. 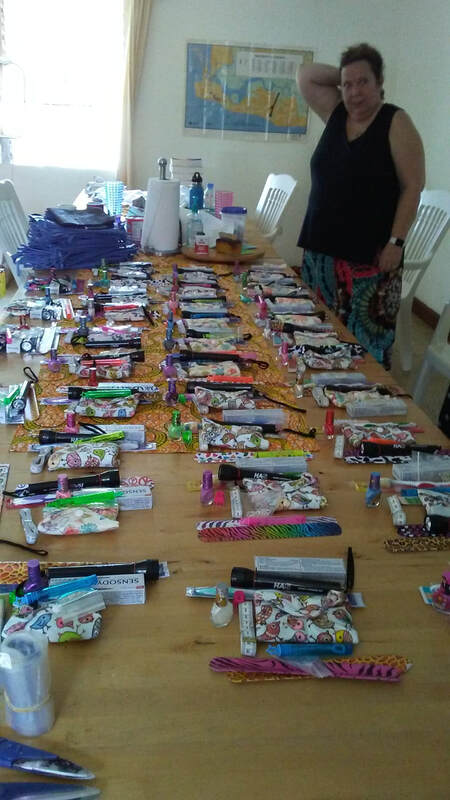 They also discussed how to use the materials with the staff at the Phebe Training Program and spent two days interacting with the women and girls at Rehab. They met with Karen Ackley Kern, ELWA Guest House Manager, to discuss our possibly using their guesthouse on future trips to Liberia. They also looked into accommodations at the Passion Hotel in Gbarnga to use on out trips up country to Phebe. They met with Dr. Wilhelmina Jallah M.D., who made several suggestions regarding waiting home construction and resources for building plans. 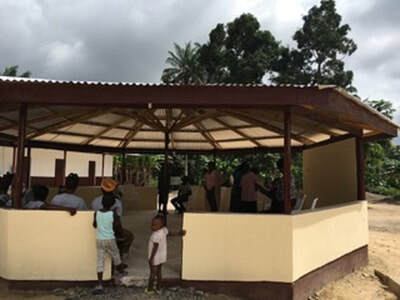 Additionally, they met with Russ, a general contractor at ELWA to get an idea of construction costs for estimation purposes, and planned for sustainability. Russ will serve as a source for materials purchases. Following discussions with Rev. Emile Sam-Peal, Director of our NGO Office in Liberia, the Board voted to hire Matthew Walters to serve as office manager. Walter works out of our office located in Dr. John Mulbah's clinic. Thank you for taking the time to read this brief update. I will be sharing more in the Let’s Palava blog in the weeks ahead. 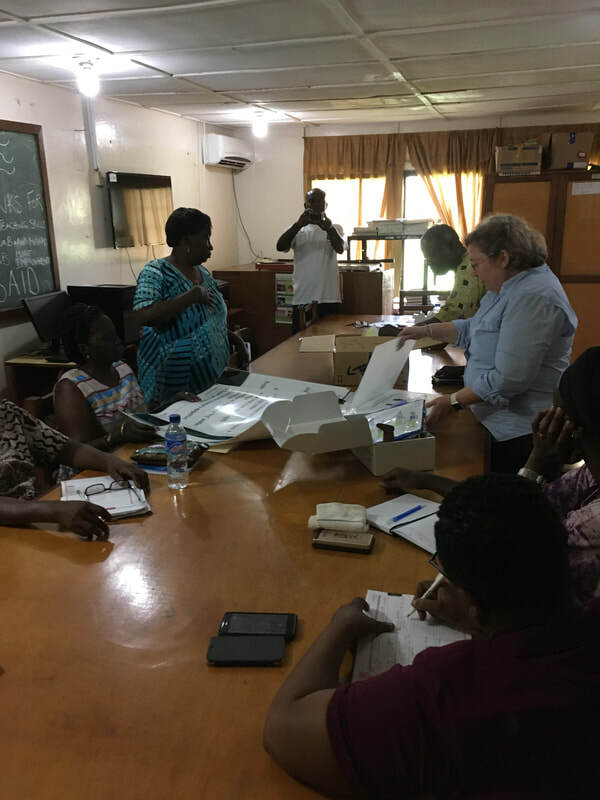 Becky reviewing how she would use nursing education materials with staff at the Phebe School of Nursing. Laerdal Global Health has materials designed specifically for the developing world. Becky, Anne-Marie, and Kathi shared this video of men making palm oil. The Palm kernel is bright red orange and the size of an unshelled almond. Anne-Marie reported that it was 85 degrees with 76% humidity. The folks making palm oil had to be hot. The pit is rock lined and they added boiling water periodically. A warm welcome for Kathi, Becky, and Anne-Marie.